Migrating DHCP from Windows Server 2003 SP2 to WS 2012 R2 Platform . | Chinny Chukwudozie, Cloud Solutions. ← Interactive PowerShell 4.0 Script Automates Active Directory User and Mailbox Creation. Migrating DHCP from Windows Server 2003 SP2 to WS 2012 R2 Platform . Migrating DHCP from WS2003 to WS2012 R2 with PowerShell on the source server throws a dhcp version conflict error. The recommendation is to use NetShell for the initial export and import . 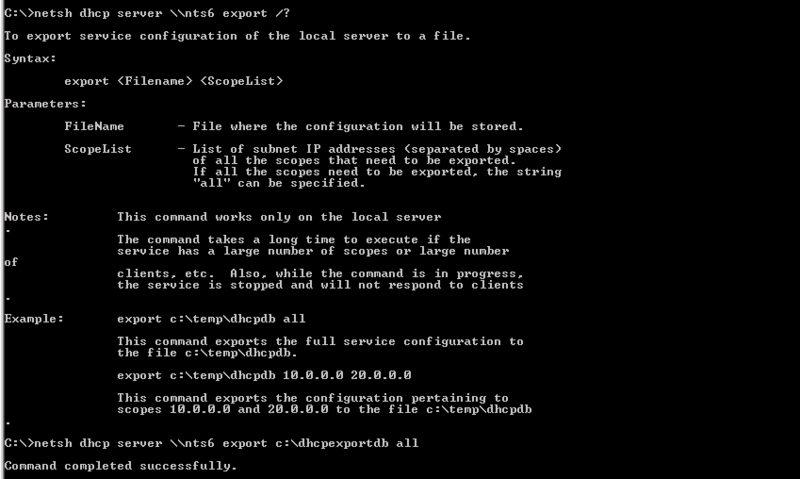 1) Login to the current WS2003 DHCP Server and open a command prompt console as administrator. 4) Copy the dhcp exportdb file to the WS2012 R2 server. 5) Configure a Static IP Address on the Target DHCP Server. Review the new DHCP Server configuration to make sure all scope settings are available. If satisfactory, unauthorize the Windows Server 2003 DHCP and authorize the new server. Test to make sure that client dhcp discover requests are getting served properly on the new server (A quick ipconfig/release and ipconfig/renew will do. An ipconfig /all will show the dhcp server for the client) before shutting down DHCP Service on the old machine. That’s it. It’s done. MS Technet has more information on WS 2012 R2 DHCP Service. I hope to write about WS 2012 R2 DHCP Failover in a future post. This entry was posted in DHCP, Migration, Windows Server 2012 R2 and tagged DHCP, Migrating DHCP, NetSh, NetShell, Windows Server 2003 SP2, Windows Server 2012 R2. Bookmark the permalink. 4 Responses to Migrating DHCP from Windows Server 2003 SP2 to WS 2012 R2 Platform . 1. It doesn’t export complex configurations – ex. multicast scopes. 2. If you are planning to configure DHCP Failover later, you will get error messages. Using smigdeploy might seem more complex and harder to use, but IMHO that is a safer approach. Thank you for the feedback Dean. You are right in your assessment. I haven’t worked with the WS2012R2 migration tools yet. I plan to use it for File Services migration in the coming weeks. I’ll do some research with the Migration tool and post an update. Thanks again.